Nailing jelly to a wall: is it possible? We've all heard the old saying "it's like nailing jelly to a wall" to describe a task that is very difficult or impossible. But is our view of the difficulty of this task justified? Has anybody actually tried nailing jelly to a wall? In this experiment I attempt to establish, one way or the other, the validity of the old proverb. I sourced the following materials from Sainsbury's and Focus. 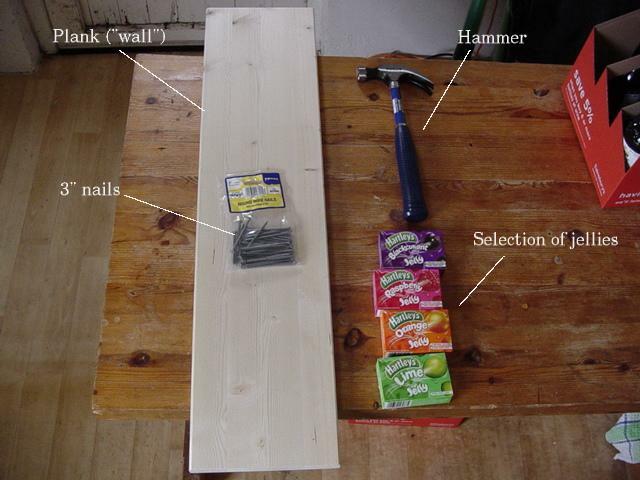 They are: a 16oz claw hammer, a 200g pack of 3" (75mm) round wire nails, a selection of 135g packs of Hartley's jelly cubes, and a plank of wood, dimensions 850x200x18mm (approx. 33½"x7¾"x¾"). The plank of wood will play the part of the "wall". The type of wood, and its exact dimensions, are not important. The length of the nails is important. 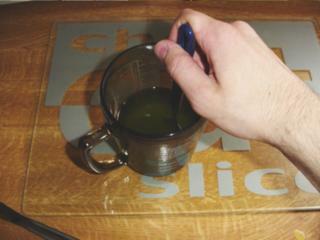 Specifically, the nails should be longer than the depth of the bowl intended for use as the jelly mould. This is to enable the nail to go right through the finished jelly and into the wall without the nail first disapparing into the jelly. 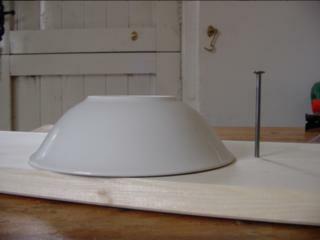 The picture below shows the proposed jelly mould (an ordinary dessert bowl) and one of the nails next to it for comparison purposes. 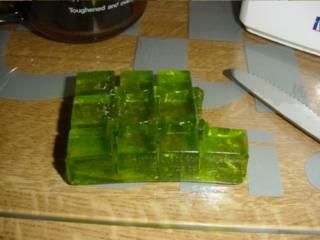 A box of jelly, as purchased from the supermarket, contains twelve joined "cubes". The orange flavour is shown below. 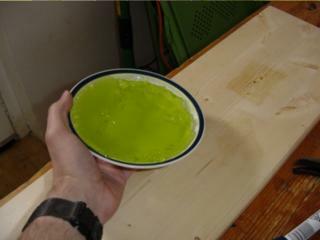 This is "concentrated" or "neat" jelly; the idea is that water is added to produce actual jelly. Of course, these cubes are much more viscous than the diluted mixture produced by adding water. 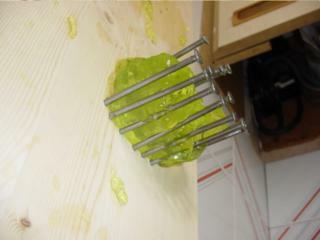 Therefore, it should be easier to nail the concentrated cubes to the wall than the actual jelly. In fact, the jelly didn't even need a nail to stay on the wall. It just stuck there. For good measure, I drove a nail through it. The jelly held in place. My first attempt being somewhat against the spirit of the proverb, I decided to repeat the experiment with proper jelly. 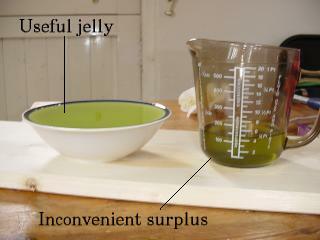 The procedure for making jelly from the jelly cubes is documented on the reverse of the jelly boxes; a summary is given here. 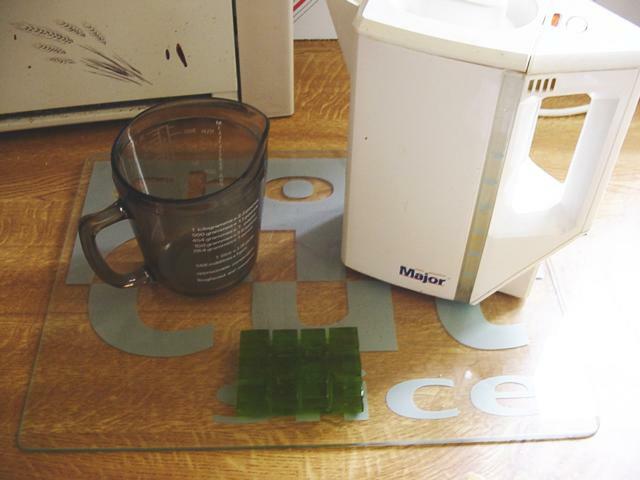 The picture below shows the equipment required: some jelly cubes (lime this time), a measuring jug, and some boiling water. 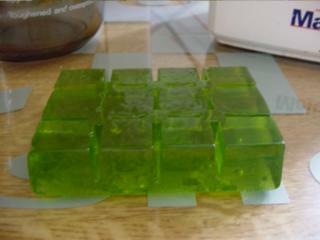 Do not eat any of the neat jelly cubes, no matter how nice they look. They're incredibly sweet and probably addictive; if you eat them all you won't have any left for the experiment. 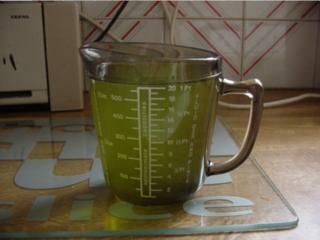 Pour half a pint (284ml) of boiling water into a jug, and add the cubes. Stab the cubes indiscriminately until they've all dissolved. 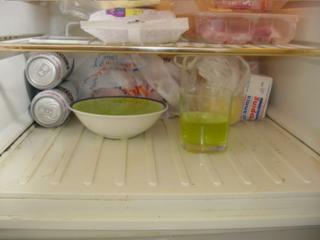 Then add another half pint of cold water, so the jug contains a pint (568ml) of jelly mix. 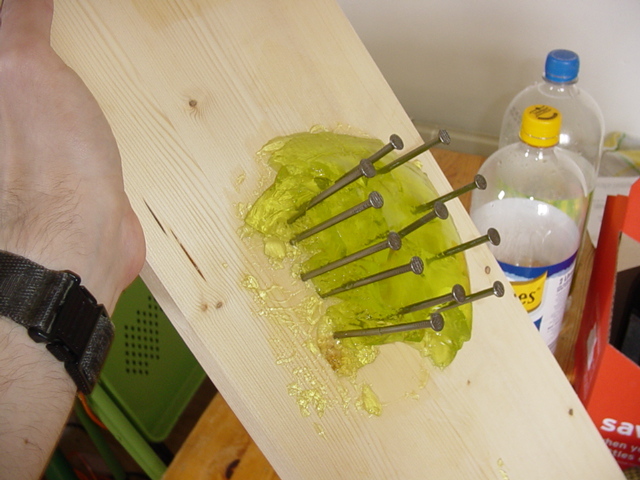 Given that the intention is that this jelly be nailed to a wall, we might intuitively get better results if we add less water than required, in order to give a thicker and presumably sturdier mix. 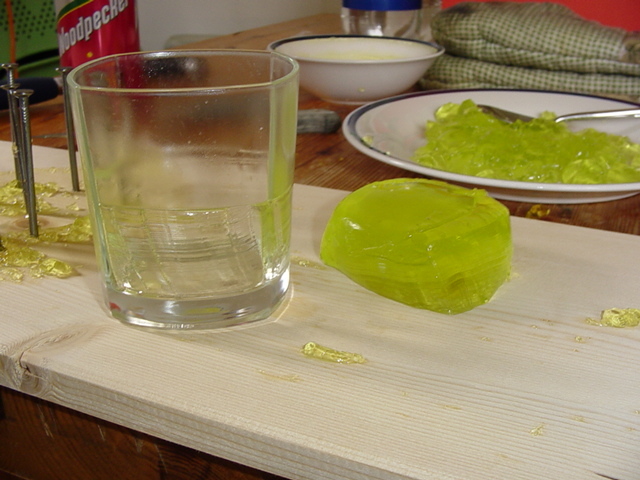 However, in this experiment the jelly will be prepared according to the instructions on the packet to ensure a fair test. Pour the jelly mix into whatever is being used for the jelly mould. In this case, as mentioned before, we are using a simple dessert bowl. 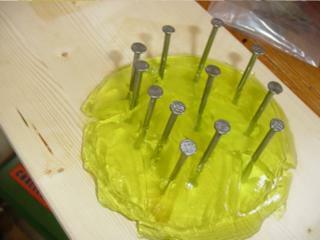 The only restriction on the type of mould used is that its depth should be less than the length of the nails. 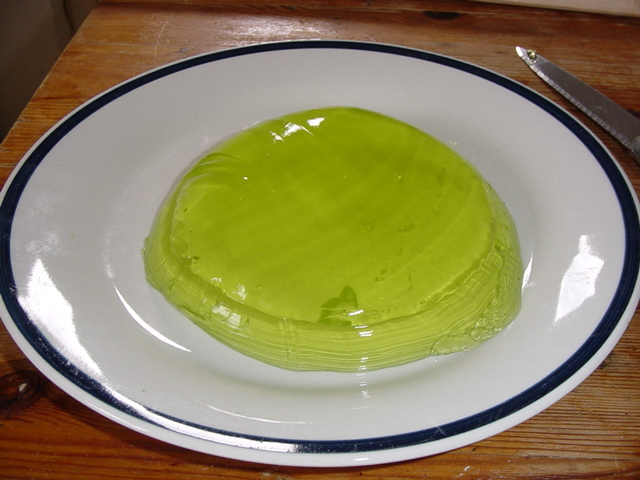 If you reproduce this experiment, you will probably find that there is an irritatingly small amount of jelly mixture left over in the jug once the mould is full. 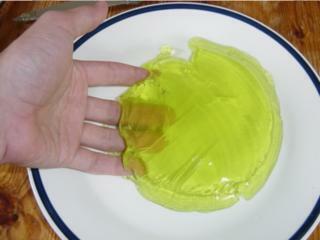 Pour this footling amount of jelly into a glass, and place it in the fridge alongside the bowl. For maximum confusion, don't tell any of your housemates about it. Finally, leave the jelly to set overnight. 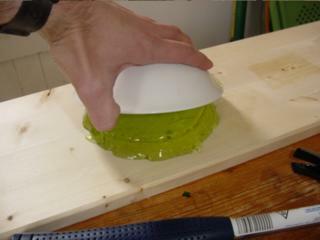 When the jelly has set, cover it with a plate, upturn the entire arrangement, and carefully lift the bowl off the jelly. Then realise that the jelly is still stuck to the bowl. Hit the bowl with a spoon a few times (to no avail) before attacking the edges of the jelly with a thin sharp knife to loosen it. 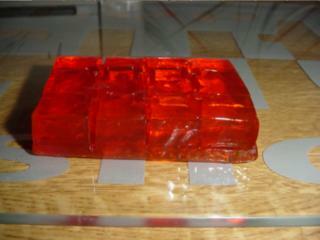 The logical next step would be to pick up the jelly and nail it to some surface perpendicular to the floor. Unfortunately, the first of these steps was impossible; trying to pick up the jelly with bare hands resulted in its partial disintegration. So, I opted for a compromise; I got the jelly back in the bowl, and upturned it directly onto the plank, while it was horizontal. 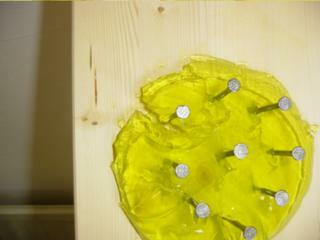 With the plank horizontal, I drove a nail through the centre of the jelly and into the plank. 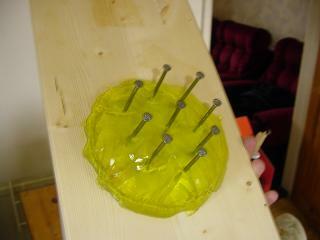 I then added a few more nails to hold the jelly in place. 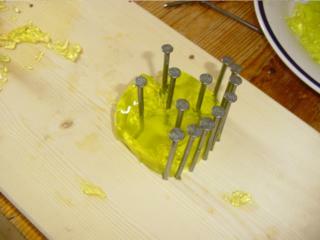 Unfortunately, even with nine nails in it, the jelly was starting to break around the nails when the plank was tilted. Seeing nothing better to do, I added three more nails at strategic points. 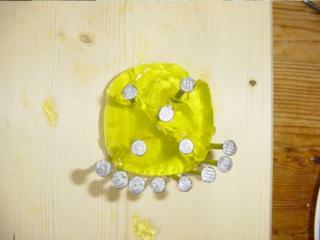 When the plank was tilted, half the jelly broke off completely and fell to the floor. The weak points seemed to be near the nails. The jelly's structural integrity now having been seriously compromised, the rest of the jelly followed about half a minute later. 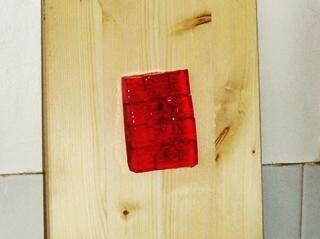 This attempt at nailing jelly to a wall had therefore resulted in quite a convincing failure. I suddenly remembered that I had more jelly. The glass into which I poured the excess from the jug was still sitting in the fridge. I retrieved it and extricated the jelly. Perhaps a smaller amount of jelly would nail to the wall easier? 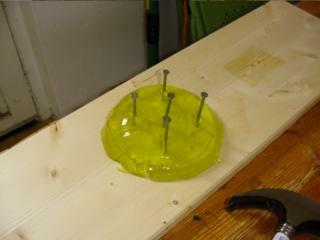 Taking no chances, I not only nailed the jelly to the plank using five nails, but also added a crescent of eight nails below the jelly to catch any wayward lumps. This worked for approximately half a minute. Unfortunately, although the jelly that fell off was briefly caught in the crescent arrangement of nails, it fell through the gaps after a small amount of time. Before long, there were only trace amounts of jelly left on the wall. 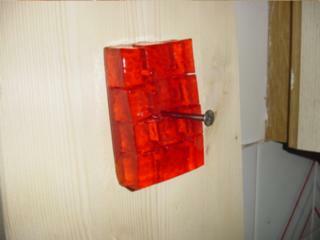 Given some jelly mixed according to standard procedures and a vertical wall, it is not possible to nail the former to the latter and have it stay there for any significant amount of time. Furthermore, these experiments were conducted by nailing the jelly to a horizontal surface which was then gradually tilted. Nailing jelly to a wall while the wall is vertical is an intractable problem in itself due to the difficulty in picking up jelly with the hands without it disintegrating. 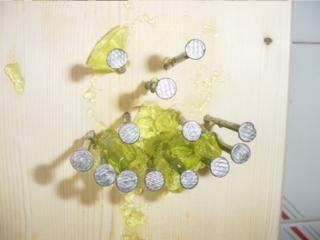 Even using many nails to construct a receptacle for the purpose of catching the jelly, which is not technically "nailing it to the wall", resulted in failure. This was because the gaps between the nails afford to the jelly an easy means of egress from the receptacle. 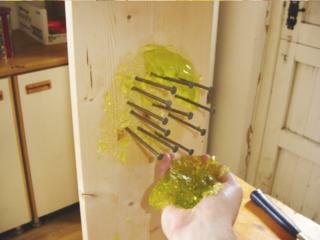 Further research into the area might involve the nailing to the wall of a stronger jelly mix. 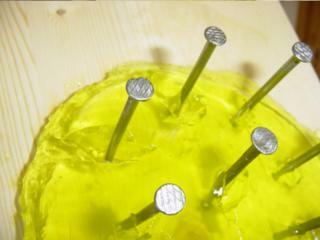 Alternatively, the "wall" could be placed, nails first, into the jelly while it's setting, to allow the jelly to set around the nails. Then in the morning the bowl can be removed, leaving the jelly nailed to the wall. 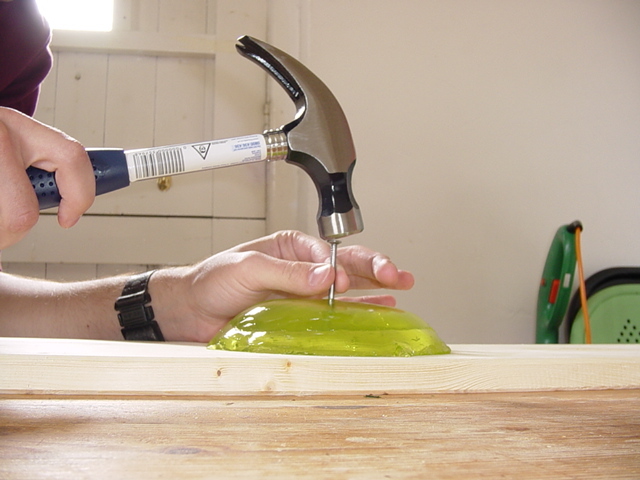 The old proverb, then, is justified, and the reader may say that an impossible or near-impossible task is "like nailing jelly to the wall" safe in the knowledge that the assertion has some scientific evidence to corroborate it. I conducted this experiment as a little diversion in the lazy few weeks between finishing my final year exams at university and graduating, back in June 2005. Since then, there have been various developments, summarised here as they happen. 26th October 2006: Attention Americans! What you call "jello", we call "jelly". What you call "jelly", we call "jam". That's the long and the short of it. However, I've recently been sent a correction, and I wouldn't be a proper pedant if I didn't address it. Michael writes on the comments page that "Jell-O" is in fact a brand name, even though it is often used generically. He also tells us that the jelly-jam thing isn't so simple - what they call "jelly" in the US is a gelatin-based food spread, and what they call "jam" is a fruit preserve, which is also what we call jam in the UK. So apparently, "jam" means the same thing in both countries. I wrote the above "Attention Americans" update in October. It's now February, and a link to this page has recently been posted on boingboing. (That would explain why the page has had so many visitors in the last three days.) This unexpected publicity has made its mark on the comments page, particularly in the form of more detail about the jelly-jello-jam-preserves debate. It turns out that it's a lot more complicated than I first thought. It's best summarised by Thomas Farrell and Charlene on the comments page. It's one thing for this page to be linked on a popular website like boingboing. It's even better to see it on a site I regularly read and post on, b3ta! They've included it in their latest newsletter. 4000 visits today and counting. In the above writeup, I concluded that further research might be necessary to ensure that the jelly stays nailed to the wall. Well, it turns out that back in February, myscienceproject.org did just that. Not only have they attempted what suggested in the conclusion about allowing the jelly to set around the nails, but they've also tried out some of the suggestions you made on the comments page. 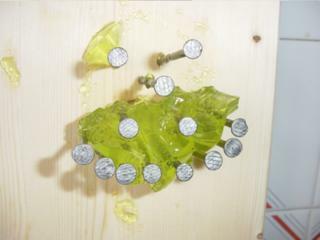 They tried hammering the nails through straws pre-moulded into the jelly, fortifying the jelly with noodles, banana slices and plastic meshes and using ballistics gelatin ("used to test the penetrating power of firearms"), instead of jelly. The experiments had varying degrees of success, and you can read about them here. This page is copyright 2005 by Graeme Cole. What are you allowed to do with it? Pfft. Anything within the realms of common sense, really. I don't want to prescribe rigidly what people can and can't do with it, so I've decided on a benchmark. It's this: you're allowed to do with this page anything you wouldn't mind me doing with your cat. So yes, you can photoshop it for comedy effect, you can copy bits of it for illustrative purposes and so on, but you can't steal it and pass it off as your own.